Here is Comet 2005 S! SOHO, it is the tiny streak 1/3 of the way from the occultation disk, towards the lower righthand side. Currently around magnitude 3, it will not be visible from Erath to the naked eye when it exits the Sun. Well, all the exams are marked, the essays are marked and the results posted. My Mum has gone home, so I can have access to my computer once more. But I am off to Norton Summit for some more atrophotography (and of course camping with my family), so you will have a few days for some more posts. Have a nice weekend. Occultation weather forecast - not so good. Sadly, there is forecast for rain and cloud on the evening of the 22nd for Tasmania, Victoria and South Australia. Almost all other major regions should be fine. So have a good occultation, I suspect I shall be looking at cloud though. So this might be an opportunity for me to finish my Celestia tour of the new Kupier Belt objects, including the putative 10th planet UB313. I've finally got the data for EL61's satellite, tidied up some other information and formatting, so I am ready to write. Only my mother turns up tomorrow for a visit, so I may not have access to my computer for a while, as she will be staying in the guest room, which doubles as our computer room. Brendan Nelson clarifies ID position. Back in August I wrote about our Federal Education Minister giving qualified for support for teaching Intelligent Design creationsism. Now the Ministers office has released a letter explaining that Dr. Nelson doesn't think ID should be taught in science class. This is a great relief. John Wilkins has the details over at Evolving Thoughts. In the meantime the AAS (that's the American Astronomical Society, not the Australian Academy of Sciences) has given it's collective response to Intelligent Design creationism (guess what, they favour good science not ID), read more at the Bad Astronomer's blog. The Australian Academy of Science doesn't have an ID policy just yet, but you can read their thoughts on old-style creationism here. I couldn't resist playing with Stellarium some more. The image is of the coming conjunction of Mercury and Jupiter (Mercury is the dot between Jupiter and Spica, I didn't want to add a label as it would clutter the image), between October 3-7. It will be difficult, as the planets will be around a handspan from the horizon at civil twilight. I have written a Stellarium Script for this event. As before, save it in the folder /data/scripts, then press M and use the arrow keys to cycle to the script menu. I've also cleaned up my Pleiades Occultation script, thanks to the Stellarium Forum folks. I now have a utc date option and a much better way of slewing to the Moon. Commands for writing Stellarium Scripts can be found here. In Australia on the 22nd of September, from around roughly 11.30 pm, until around roughly 2.30 am the beautiful Pleiades cluster will be occulted by the waning Moon. Several stars will be covered and revealed by the Moon. This will be a rather beautiful sight, the very first thing I saw when I set up my very first telescope was an occultation of the Pleiades (totally by accident, I had just trained it on the Moon to see what I could see, and I saw an occultation, I was blown away). It will be best appreciated with binoculars or a small telescope. This event will also be seen in New Zealand, New guinea, Indonesia, parts of Malaysia and Singapore. For detailed contact times see the Southern Skywatch Occultation Section. 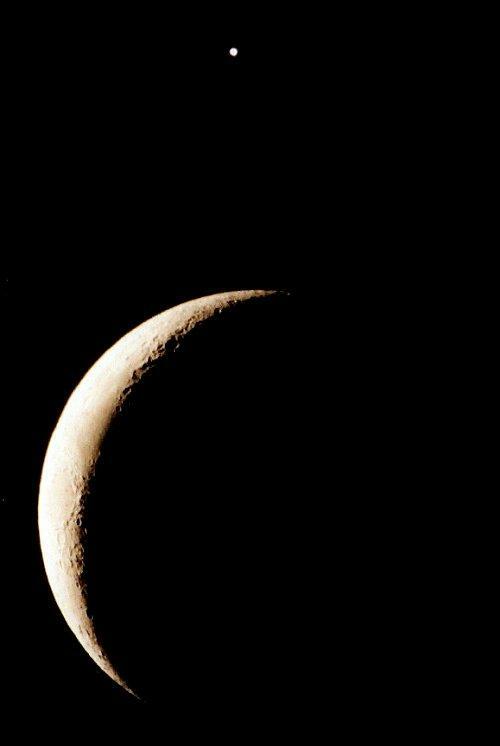 If you have Stellarium and want to see what the occultation will look like from your site, try this script (my second Stellarium Script) after editing it for your local circumstances. Copy the section below into a text editor, change it to your latitude and longitude and save it as Oz_Pleiades_Sep22.sts in the /data/scripts directory of Stellarium. 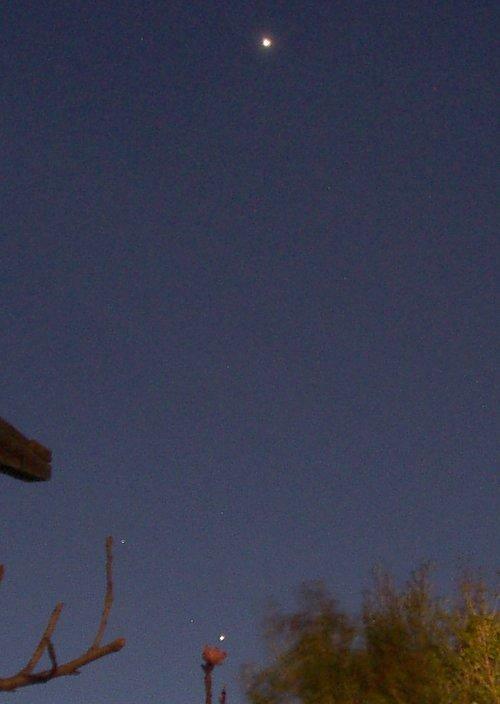 Northern Hemispherians should keep the values to see what the occultation looks like from Adelaide. # Australia, New Zealand, Indonesia etc. The bright spot above the coronagraph disk is Mercury, at inferior conjunction today (Sunday 18 Sept). The spike through it is due to CCD saturation. Inferior conjunction is when a planet lies between us and the Sun (naturally this can only happen to Venus and Mercury). Because of SOHO's L1 position, Mercury is not in front of the Sun under the coronograph disk (and the geometry is only rarely right for Mercury to pass across the Sun's disk from Earth anyway, it happens around 13 times a century). The close proximity of Mercury to the Sun of course means that it will be invisible to us. 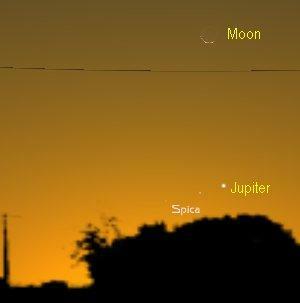 It returns to the evening sky in late September, and in Early October will have a great conjunction with Jupiter. As always, click to enlarge, Venus is up the top, Jupiter is bottom right just above a peach blossom, and Spica is bottom right, near a peach branch. 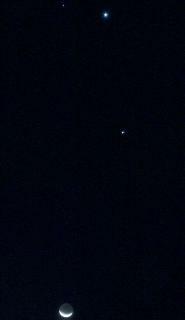 The "star" visible in the full size version between Jupiter and Spica is an artifact. With all the bad weather stopping us from seeing any aurora (or me from getting any images of sunspot 798/808, which is decaying as it moves off the Sun's face), we also didn't get to see Venus as it moves away from Jupiter and Spica. The clouds finally broke in the late afternoon, allowing me to get this image. This image was not without its hazards, the Bettdeckereschnappender Weisle had just put down lawn feeder. The smell was, well, very, very bad and one had to tread carefully to avoid the stuff getting on your shoes (or camera tripod). The peach tree framing Jupiter and Spica is one she has just put in. Unfortunately it will soon block out my views to the west, so limiting my astrophotography in that direction (and co-incidentaly destroying the fence it is hard up against, but I didn't win that argument). 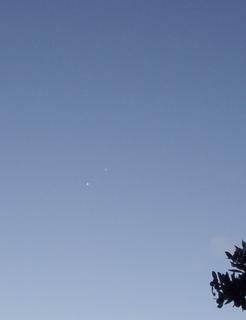 Venus is on its way to its meeting with alpha Librae (Zubenelgenubi, what a name) on the 24th and 25th of September. Jupiter is beginning to line up with Spica, and in early October it and Mercury will have a close encounter. One of the things scientists were hoping to see on the Cassini mission to Saturn was a methane sea. There had been lots of tantalizing hints that large portions of Titan might be covered in liquid methane, and the Huygens lander had even been built to float on Methane, if it landed in such a sea. However, preliminary radar observations didn't detect large areas with liquid features, and Huygens landed in the equivalent of mud (the "dirt" was probably ice and the fluid probably methane). While Huygens imaged things that looked like rivers and shorelines, it looked as if the tide was out. The latest radar imaging from Cassini shows something that looks a lot more like a sea (or at least a lake). There is a large, dark and above all smooth feature that could be lake, there are what looks to be a shoreline and drainage channels. While the large methane oceans are absent, there appear to be areas such as this one here there are methane lakes. They may be filled by periodically methane "rain" or seepage for underground reseviours, rather than being permanent features. There are many more close flyby's of Titan scheduled to observe the terrain in greater detail, to determine if these areas really are "lakes". The next close approach will target the Huygens landing area. Yep, Monday 19 September is International Talk Like a Pirate Day. Hoist the Jolly Roger, put on your best pirate clothes, and talk like a pirate. Pop over to PZ's place and try his blog in Pirate Mode. A brush by from a Coronal Mass Ejection not driected at the Earth triggers a two day geomagnetic storm seen well towards the equator, a near head on collision with a CME balsted out by a triple C class flare event does, well, not very much. Why is this? Well, nobody really knows. The iteraction of the twisty magnetic fields of the CME with that of Earth is poorly understood, and prediction is fraught with uncertainties. While everyone expected this CME to have a high probability of having the right stuff, it turned out it didn't. Still, more flares have happened, and there is still chance of an auroral storm yet. In the meantime, console yourself with more gallery images from Space Weather and Solar Terrestrial Dispatch. 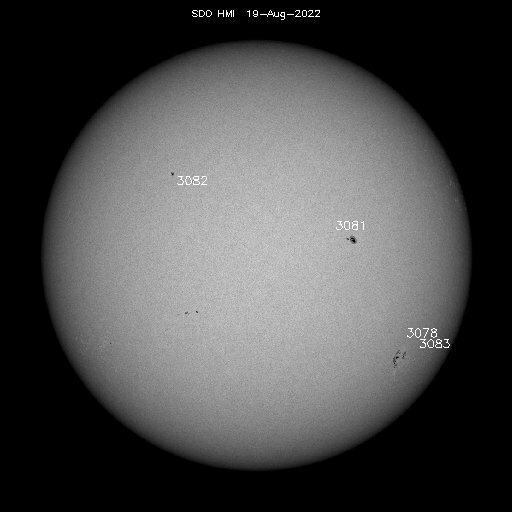 Also have a look at Megan's latest Solar image. Then pop over to the Alaskan auroral web cam, and see if anything is happening (its cloudy at the moment). 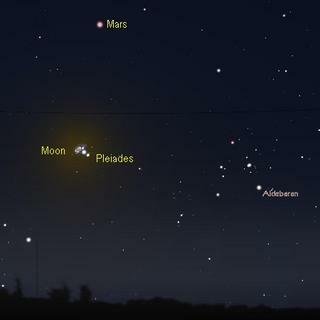 If it is still cloudy you can download the latest version of Stellarium, and pretend you are looking at the night sky. Then over to Tom's for the latest on the Russian Astrologer suing NASA. Or you can head to the Hayabusa site and download this animation of the apporach to the asteroid. ..but then nothing much happened. Well, the Kp index only went to 5 in Hobart (but it stayed there for a while), which mirrored pretty much what happened in the rest of Australia. At least there wasn't a magnificent aurora display completely obscured by clouds. To console yourself, read this article about the weird Space Weather we have been having. Did I mention it was cloudy? Yep, it's cloudy (there is a reason my blog is subtitled "Obscured by Clouds"). But then, most of Southern Australia seems affected by cloud. 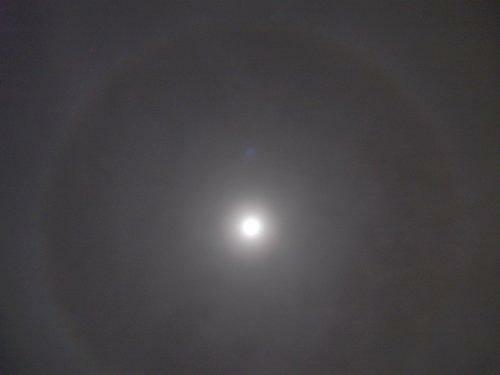 At least I got a nice shot of a Moon Bow (click to view larger version, it may be a bit murky on some monitors). Still waiting for Aurora here in Australia. Kp is 5, Solar Wind Velocity: 739 km/sec; Bz: -2.0 nT; Density = 1.0 p/cc. In Alaska the aurora are still going strong. Compare the Northern Hemisphere Aurora oval with the Southern Hemisphere aurora oval. Image, the CME launched by the X class flare back on the 14th that we are waiting for. The bright dot is Mercury. Image credit SOHO. [8:50 ACST]The CME has hit the ACE spacecraft, and it should hit us soon. The background Kp levels have risen from 2 to 5, so we wait anxiously for the storm. In the mantime visit this aurora web cam. Aurora are happening in Alaska right now. There is this Alaskan Aurora Webcam as well, but it doesn't seem to be working at the moment. Oh yes, and 798/808 just let off another X class flare. The LASCO cameras on SOHO seem to be playing up, so no images of this one. The time of arrival of the Coronal Mass Ejection associated with the X class flares I reported has been updated (and there has been a third X class flare). The CME should hit sometime on the 15th here in Australia, not the 16th. It could hit as early as 9:00 am AEST on Thursday the 15th (that's 23:00 UT on the 14th for non-Australains). The Australian IPS has issued a major/severe storm warning for the 15th, and a minor storm warning for the 16th. There is also a mid-latitude aurora warning out. New Zealand, Tasmainia and Southern Victoria should defintly be on the lookout, while Southern New South Wales and Southern South Australia should be on the alert. The bad news is that the weather forecast is fairly dire, with rain predicted (see BOM map), althought it may clear in SA in the evening. Also, the Moon will interfere a bit beofre midnight. Image Credit SOHO LASCO 2 camera. 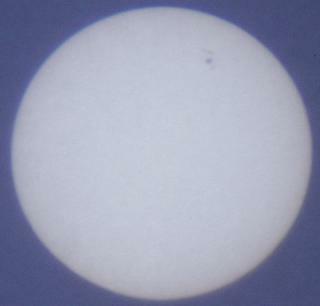 Early this morning Sunspot group 798/808 let off two X class flares. This time the associated Coronal Mass Ejections appear heading more or less straight at Earth, so we can expect geomagnetic storms, and possibly aurora, somewhere around Friday 16 to Saturday 17 September. The waxing Moon may interfere with aurora observing though. For some nice images from the two day geomagnetic strom that was clouded out in Australia, see the SpaceWeather Gallery and the Solar Terrestrial Dispatch Gallery. No geomagnetic storm tonight, just rain storms. 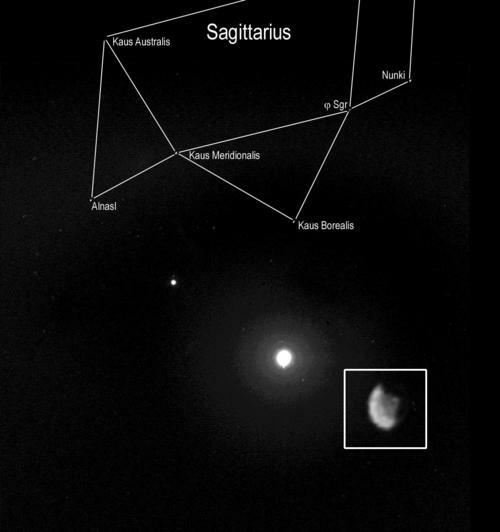 Pop over the the Mars Rover site for some fantastic images of Phobos and Demios as caught by Spirits low light camera. Includes a great animation, but the opening lines of each of the sections is exactly the same, so reading the accompanying text is boring. Don't let that stop you from scrolling down though. Pop over to Megan's Blog for a nice shot of 798/808 and a prominence. Also drop in to the Guardian's Bad Science page for this amusing and devesatating look at science journalism (hat tip to Megan). Says it all really, some of the longest ongoing geomagnetic activity in this Solar cycle and all we see is clouds. No word from any of the aurora hounds, this cloud is too wide and too deep I fear (just heard form one NZ observer, nothing his way). However, given that sunspot group 798/808 is still popping off flares (3 M class today, one an M6) we can expect on-going geomagnetic activity for at least the next day or so. After watching the movie in the previous post, have a look at this most recent stunning page in the Space Weather Gallery. there are also some closeup shots of sunspot group 798 by Paul Moss (the edge of the image is not the edge of the Sun), and some new 798/808 close-up shots by Andy Dodson. And now I am going to bed. The Kp index is still at 6, the clouds still cover the sky. Why not pop over to Christopher Picking's astrophotgraphy site for a beautiful movie of last nights aurora as seen from New Zealand. Then pop over to the JAXA site for the latest images from Hayabusa, now just 20 km from asteroid Itokawa. Kp Index 6, Solar wind Velocity: 1000 km/sec; Bz: -3.0 nT; Density = 2.0 p/cc. High latitude auroa warning (ie Tasmania and Soutthern Victoria). Blasted cloud everywhere. Here are some good shots of Sunspot 798/808 oer at the Iceinspace forums. (Updated 9.25 pm ACST), it's only the bulk Australian Kp that is 5, Southern Victoria and Tasmania are still at 7). Kp index (overall) has now fallen to 5, after being at 7 for a long time. Most of Australia and New Zealand in the active zones was clouded out. Still, there promises to be a lot more geomagnetic activity in the coming days with potential for aurora, so keep tuned. And visit the Spaceweather Gallery for some nice pictures of auroa from today's event in the US. "More aurora" for example of what aurora may look like from mainland locations. The First Quarter Moon may interfere with observations in the early evening. This is an image of Sunspot 798/808, which is the source of all the excitement. The image was created using safe solar projection techniques (it's not too clear as I had to do this in between clouds and rain showers, so my focus leaves a little to be desired). This goes to show that you can do interesting astrophotography without fancy equipment. Sunspot group 798/808 has been firing off flares at a rate of knots, there have been 7 X-class flares since the X17 one, not to mention the M class flares. This image is of Itokawa when the probe was 70 Km away. Image credit (c) 2005 JAXA. Hayabusa is currently 47km from the asteroid Itokawa, this page shows a series of images from the aproach to Itokawa, eventually the probe should stand off at 20 km for an intense mapping mission, followed by a sample clollection around November. Messed up images from LASCO C3 camera, Image (c) 2005 SOHO. Following the X17 flare, there have been no less than five X class flares from Sunspot group 798/808 in the past 24 hours, including an X6 flare. Not to mention a number of M class flares. Unfortunately, there is an S2 proton storm on at the moment, due to the effects of the giant flares from 798/808, and the SOHO instruments are unable to tell us if any of these flares had Earth directed components (although it is a good bet that the last X6 flare has sent a coronal mass ejection our way). The ACE spacecraft, which is the source of most solar-wind data has also been blinded by the recent events, so we don't really know what is going on with these CME's. Sunspot group 798/808, Image (c) 2005 SOHO. So watch the night skies to the South (if you are a Southern Hemisphereian) or North (if a Northern Hemisphereian), as there may be a chance of aurora (most likely visible from Tasmania and southern Victoria, but you never know). Given the level of activity, it is likely that there will be more strong flare activity, possibly even more X class flares, when the sunspot grouping is more favorably placed for generating aurora. Sunspot group 798/808 is so big that it can be seen using safe solar projection techniques. 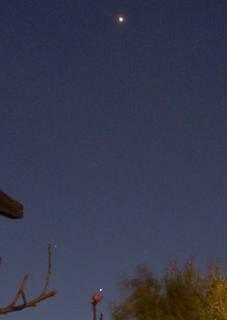 Image, Venus floats above the crescent Moon, Pentax KP SLR, Kodak Gold 400 ASA film 1/8 second exposure. As aways, click to enlarge. Well, I didn't get to put the images up last night, tiredness got to me first. The image is on of my more successful film images shot through the telescope. The film camera is not dead yet. Sadly, the Moon is somewhat over exposed, but the better definition shots also had high background due to the develpment forcing the exposures to similar brightness levels. I also pronmised links to other images. Follow this link to some stunning images by Shevill Mathers of Tasmania. Some other images of the conjunction using conventional digital camreas can be found here and here. Here is a nice image from Peter Adderely ((c) 2005), taken with a handheld Sony DSC-F717 digital camera at maximum zoom. The image is a cropped 800x600 section from the original 2560x1920 picture. Very nice. You might be interested in Peter's adaptor which allows him to use the digital camrea with a small birding telescope. He successfully used this setup to take images of the opposition of Mars in 2003. As many people have binolclars or a small telescope, rather than a fully fleged astronomical telescope, you can use similar setup to Peter's to adapt digital cameras to these instruments, and take images of some of the brighter astronomical events (like lunar eclipses, or this line up). I've run some test images throught my 10x50 binoculars, and have yet to try an astronomical photo, but I will have a go soon and report back (of course, the clouds are back). The blast was not Earth directed, so don't expect anything from this one (although there might be some disturbance on the 9th as the edges brush past us, so Tasmanian's watch out). The culprit is probably sunspot group 798, which produced significant geomagnetic storms last month. The group has been renamed 808, and if it continues to be active (a previous group fired of lots of flares when pointed away from us, and fell, silent when it rotated into view), we may be in for some more aurora. Group 808 will be in the best position between 11 and 18 September, unfortunately that is when the Moon is waxing towards full, so Moonlight might be a problem. 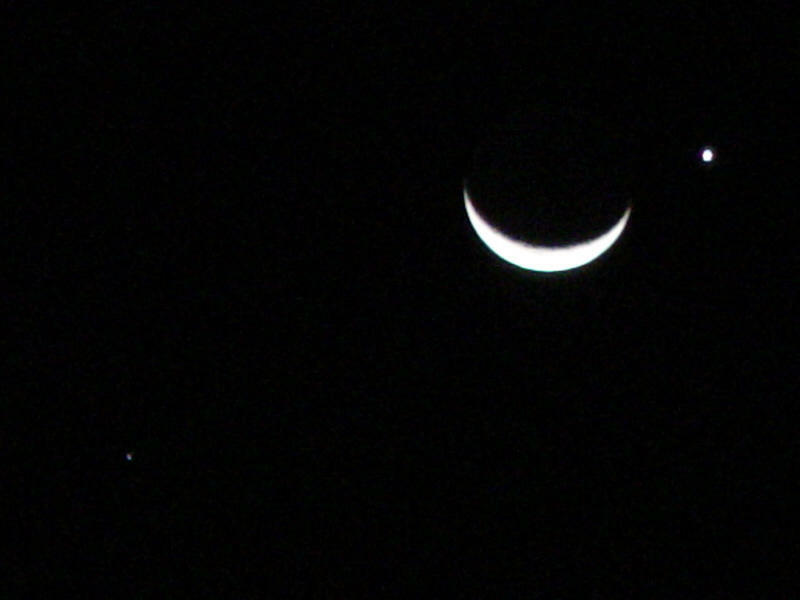 Images: Left, The Moon, Venus and Spica above my telescope. Right, The Moon, Venus (the bright one next to the Moon), Spica (the dim one on the other side of the Moon) and Jupiter (the one down the bottom; as always, click on the image to enlarge). Well, that was truly beautiful. After all the rain and son on the sky was as clear as could be, I could see Venus and the Moon on my way home from the train shortly after sunset, and as dusk gathered Spica and Jupiter popped out to complete the celestial meeting. Eldest One thought it looked good, the neighbor was delighted, even the Bettdeckererschnappender weisel thought it looked beautiful, and she is somewhat uninterested in things astronomical. My photography was not so effective though. I had a plan, it just didn't cope very well with Smallest One having another "terrible two" moment and the trusty Olympus choosing for some reason to take out of focus images. The Camera is on a tripod, triggered by a remote, and there was virtually no wind at all (and the camera was in a sheltered spot) yet 2/3rds of my images are out of focus (sigh), mostly the "scenery" shots showing the grouping with landscape items, rather than having them as dots floating unconnected in space. Anyway, enough shots came out to keep my memories going. I also shot some images through the telescope using the Pentax and the webcam. As I said, I had a plan. Webcam first, then film. This is because the webcam is a pain to focus, and the webcam, film camera and eyepieces all have different focuses (and both cameras are so bizarrely out of tune with the eyepieces and each other I can't use parfocal rings), as the scope was currently focused to the webcam, it made sense to shoot with the webcam first (also, having a greater effective magnification, it is more sensitive to turbulence). So of course I shot the film camera first. Hopefully I will get the images back tomorrow, I shot several exposures at several exposure times to bracket the brightness, so something should work (although Venus will just look like a bright star). Then onto the webcam, having to refocus it was a struggle, the I finally got it set up, shot a few quick images of Venus, and then was in the process of aligning the cam so I could get Venus and the Moons limb in the same shot (not helped by yours truly knocking the finder scope out of alignment (Tom, you can laugh now), so repositioning the Moon was painful), when Smallest One had another "terrible two" episode which needed my attention. By the time I came back, over half an hour later, the Moon had set behind the houses. At least I had a Venus shot, not lots of detail of course (must invest in a violet filter), but above you see tonight's shot next to an image I took back in July. Venus is much bigger and obviously more gibbous. So at least my Venus Phase photo essay is on track, almost. 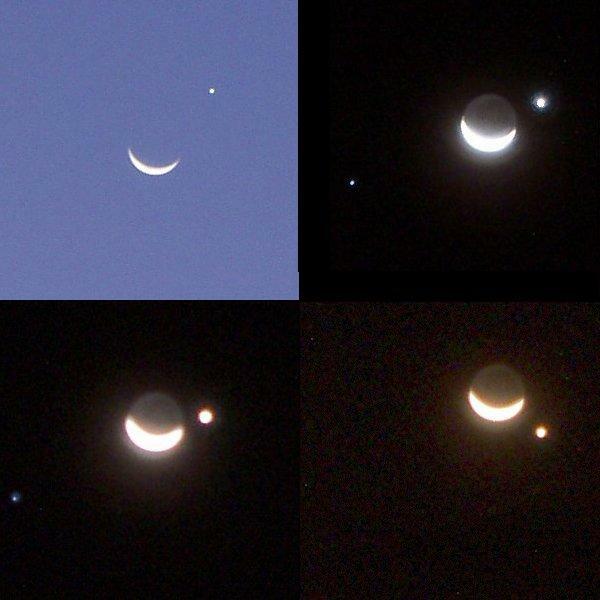 During the course of the evening the Moon moved with respect to Venus, this series of shots illustrates this movement. Could have done a nice animation if 2/3rds of my shots weren't out of focus. But in the end, the night was clear, the air was balmy, the planets and Moon looked beautiful, so I am greatly satisfied. Head over to Stuart's for coverage of the Mars and Titan Sessions of the DPS2005 meeting. Here is my animation of Venus, Jupiter and Spica (as always, click to enlarge, this will take a while). This project was inspired by Stuart's animation of Venus and Jupiter setting. The first obvious difference is that here in Oz Venus and Jupiter set well after dark, so there are no nice colours like Stuart's, and you can't see the foreground trees (which I could see, but don't come out on the image at a gamma correction of 1.8, the highest I can go before things get grainy). At the end Jupiter winks out and in as it passess through some branches. Also Venis and co are setting almost vertically compared with stuarts image. Not a bad effort for using an elderly version of Gifcon. 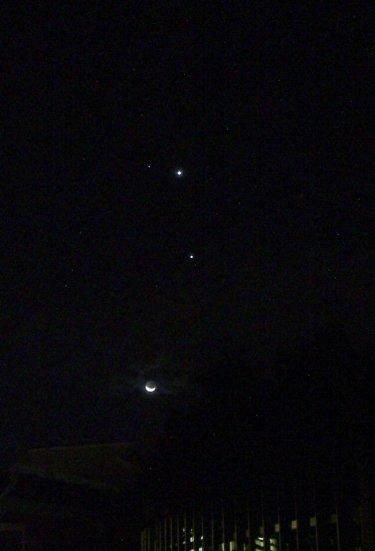 Images: The Moon joins Spica, Venus and Jupiter. As always, click to enlarge. I had planned to take a series of images from a fixed vantage point at the same time to show the movement of the planets. However, having small children puts paid to those plans even when the weather is kind. After dealing with Smallest Ones "terrible two's" training performance, it was well and truely dark. Still, it looks rather pretty. 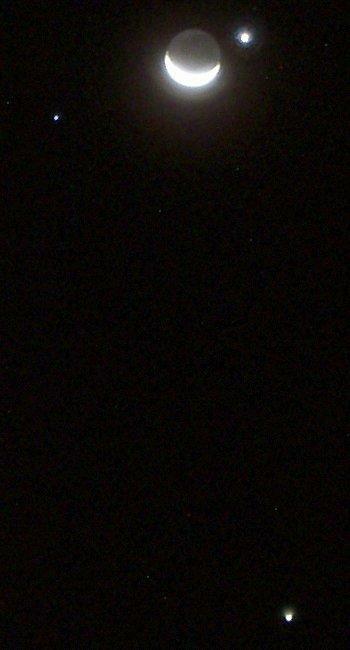 I wanted to get a picture of Venus reflected in the sea, which I saw last night on the way to the shops sans camera. After homework, finishing the dishes and putting the boys to bed, I headed up the beach. By which time the clouds were boiling over the horizon and spectacular lightning strikes were lighting up the sky. Sadly, despite multiple trys I only caught the tail end of one lightning bolt. It's raining now, it might clear up by tomorrow night. Stuart is over in Cambridge UK, at the Division for Planetary Sciences (DPS) 2005 meeting. Pop over for some live astronomy meeting blogging. With the ongoing tragedy of Hurricane Katrina, and the national communications carrier Telstra throwing a wobbly over government regulations, what was the entire front page of the Adelaide Advertiser given over too? The forthcoming ariel ping-pong AFL match between the two local footy teams. I could weep. 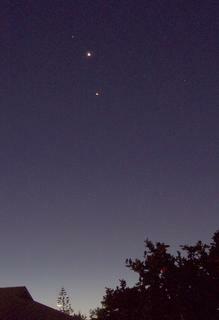 Image, top to bottom, Spica, Venus, Jupiter, as always, click to enlarge. It was Fathers Day in Australia yesterday (Sunday). The cloud and rain that had obscured the conjunction of Jupiter and Venus finally went away (especially Saturday when Eldest One played soccer in the pouring rain while devoted parent watched his sodden son from under an umbrella and raincoat). The day started auspiciously. When I tried to get up, Eldest One told me I had to stay in bed, it was Fathers Day. So I got breakfast in bed (although Smallest One drank all my apple juice), and was duly presented with a variety of lovingly made cards (Middle One's was a folding out Bear; "he's eaten someone!" Middle One said joyously) a hand made keyring tag and a book mark with a bottom on it (from Eldest One; now inserted, without too much irony, in Simon Winchester's "Krakatoa") and a 3 D cell Maglite. I've had a minimaglite for ages, a beloved present from the Bettdeckererschanppender weisel, which has been my constant companion on bush walks and, covered in red cellophane, during my astronomy nights. Bright, dependable, economic with the batteries and with a handy headband for hands free use (I look a dork using the headband, but I look a dork to start with, so there is no downside) I really like my minimaglite. But now it has a rival in MegaMaglite. This thing is a monster, it can melt bitumen at 40 paces. It will come in very handy when bushwalking for spotting night life (in other states even) and while it is no green laser pointer, I can use its narrow focus beam to point out stuff in the sky, as it has a very visible beam. I can see me and Mega having a long and fruitful partnership. Anyway, after my luxurious breakfast repast, we cycled down to the beach to help the local coastcare group remove noxious weeds. With a startling blue sky above, waves lapping gently on the beach, native daises and pigface flowering, what could give one more satisfaction than extirpating invasive weed species? Well, according to the boys, playing in the park, so we did that too. After a lovely day out, especially after being cooped up for so long by the foul weather, we were home before night fell. When dusk thickened, I got out my trusty Olympus and fired off a series of shots of Venus, Jupiter and Saturn in nearly a straight line. Inspired by Stuart, I took a series to make an animation. Hopefully the weather will hold for Wednesday, and the Spica Moon Venus line up. Venus will be 12' from the Moon here in Adelaide, so I have my various astrocameras and imagers ready to go to record this. 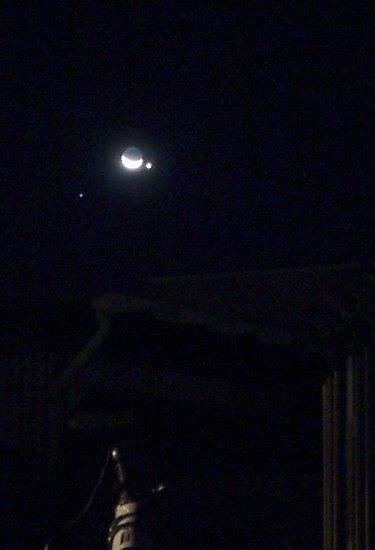 Images in the camera, I cuddled Smallest One to sleep, and sat with the older two while they drifted off, through their door, out the kitchen window, I could still see the gleam of Venus. Could you ask for a better Father's Day? "Woke up this morning, and found the sky was cloudy again". That would make a good blues song. So go off to the Bad Astronomy Blog for some new pictures, and to Stuarts Astronomy Blog for a great animation. There are also good shots here and here at Ice in Space. For those still thirsting for aurora pics, over at the Astronomical Society of Victoria there is a gallery of Shevill Mathers aurora pictures from August 24. Stunning. Also pop into the Astronomical Society of Tasmania for archive images of aurora. Oh, and house keeping annoucment, I've added some new links to my links panel on the left, including the Aussie astronomy site "Ice in Space", and links to Celestia and Stellarium. Check them out. And a big hello to visitors from South-East Asia, India and Indonesia, get ready for the occulation of the Pleiades on September 22/23 (more details shortly). Clouded out from the closest approach of Venus and Jupiter (sob). I'll just have to wait. 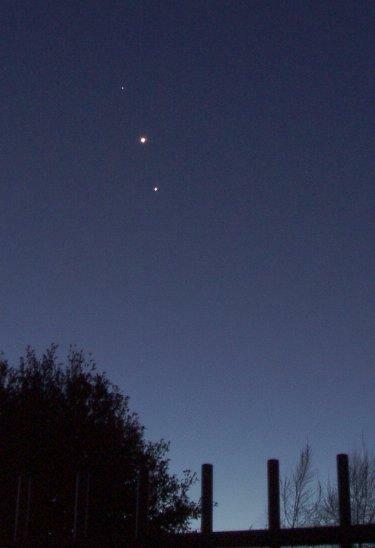 On November 16 2006, Venus and Jupiter will be only 23 minutes of arc apart, but they will be only 4 degrees above the horizon when the Sun sets. 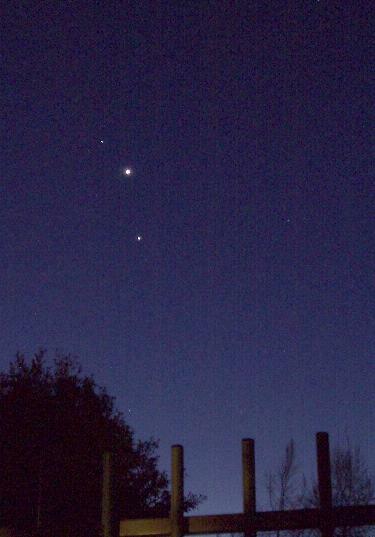 On 1 February 2008 Venus and Jupiter are less than a degree apart, and 16 degrees above the horizon at astronomical twilight, in the heart of Sagittarius not far from M22. 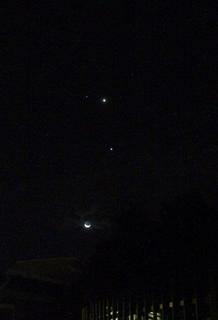 On the 4th, Venus, the Moon and Jupiter line up. In February 2010, Venus and Jupiter are very close again, but also 4 degrees from the horizon around sunset. In the meantime, pop over the the Bad Astronomer for a nice image series, or drop in at Space Weather for some more images, including one from the South Pole. Click on image to enlarge (warning, its a bit bigger than usual). Clouds finally cleared, took this shot, clouds came back. Maybe they will go away for tonights show.